A New Map of Turkey in Europe Divided into all its Provinces' with the Adjacent Countries in Europe and Asia: Drawn Chiefly from the Maps Published by the Imperial Academy of St. Petersburg. 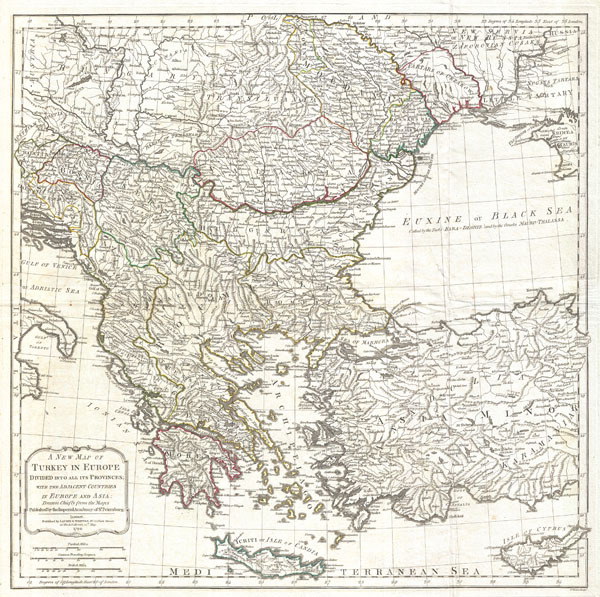 An extraordinary large format 1794 map of Greece, Turkey in Europe, the Balkans and adjacent regions by Laurie and Whittle. Map covers from the Gulf of Taranto, Italy, eastward as far as the Crimea, extend northwards to Transylvania and Moldova and southwards as far as Crete and Cyprus. Includes the modern day nations of Greece, Turkey, Cyprus, Bosnia, Croatia, Albania, Serbia, Macedonia, Bulgaria, Hungary, Rumania, Bulgaria, Moldova, and parts of Italy, Austria and the Ukraine. Offers extraordinary detail throughout, noting cities, roads, geographical features, and sub-states. Based on survey work originally completed in 1789 by the Imperial Academy of Sciences in St. Petersburg. Prepared and published by Laurie and Whittle as plate no. 24 in the 1797 edition of Thomas Kitchin's General Atlas. Very good condition. Minor wear along original fold lines - especially at fold intersections. Else fine. Rumsey 2310.050. Phillips (Atlases) 4300-23, 699. OCLC 7160203. Shirley, R., Maps in the atlases of the British Library, T.LAU-1c (1799 ed.). National Maritime Museum, 375 (3rd ed. 1801).